It is interesting that staying grounded, and not living inside my head too much for the past week and a half has meant not writing. Hmmmmm… What’s that about? I’ve been on many little adventures and celebrated another year of life. What a lovely little chapter it has been. On my birthday, a friend celebrated with John and me. Gifts of music, beauty and art seem to have come my way from friends and loved ones: a CD of a favorite group (Wailin’ Jennys) and a soft t-shirt, a bottle of sparkling water, a yummy bar of dark chocolate, pens, pencil, pretty journal and drawing paper, watercolor pencils (fun! ), and a GUITAR (and folk music books to go with it)! Everyone seems to see this as a creative year ahead. I packed all of my goodies in my car the day after my birthday and headed up to a time of silent retreat with my friend. We talked all the way up there – catching up on what we’ve each been doing and getting the words out of our system. We shared where the Sacred has been nudging us both. 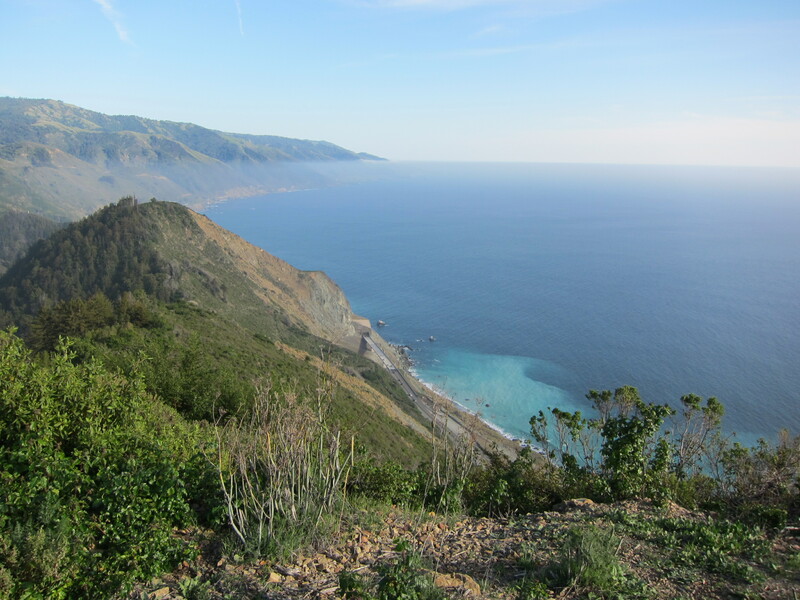 Okay, so Big Sur is a pretty fabulous place to go for a silent retreat. Who needs words there? Upon our arrival at the top of a small mountain looking out over the sea, we popped out of the car. Inside the small office/bookshop, we discovered: a lack of silence, slight disorganization, a delightfully flaky woman, some monastic granola and fruitcake and everything from rosaries and Thomas Merton books to incense, sage and wooden prayer beads. I had to get myself a little stretchy bracelet full of wooden prayer beads. Awesome! Then each of our super cool little rooms were more spacious and comfy than we had expected – with a wall of windows at one end looking out at the view and our own little backyard complete with a plastic chair, flowers, birds and a spectacular view. We bowed, “goodbye and Namaste” and each took to our rooms – both happy campers. So much happens when you are in silence. I tried to write down all I had done in that first half day (including taking a nap) and the list was long. Reading a memoir and some sacred writing, lighting a candle, trying out my prayer beads, sitting in the sun and watching the world, just BEING. Sigh. Soaking in the peace. A highlight for me was that this retreat (unlike my last one) actually brought me back to my home practice of yoga. The last one shook me up, showed me my vulnerabilities, threw me off balance. This one nurtured me and helped me live in my yogi skin up there on the mountain. At sunset the first night, I cleared a little desk and covered it with a scarf, placing a glass candle holder in the center. I lit it. I unrolled my purple yoga mat and pulled out my little list for home practice. I found my center and felt the energy streaming through as the sun got lower and the sky turned pink and orange over the water. Whew! Just awesome. I could go on for pages about just those three days. A few other highlights include: Both of us realizing that (though we had some trepidation upon arrival) we could have done several more days of silence; the good feeling of hiking up and down the two mile driveway until our calves ached and looking at the turquoise water and ocean of fog below us, alternately. 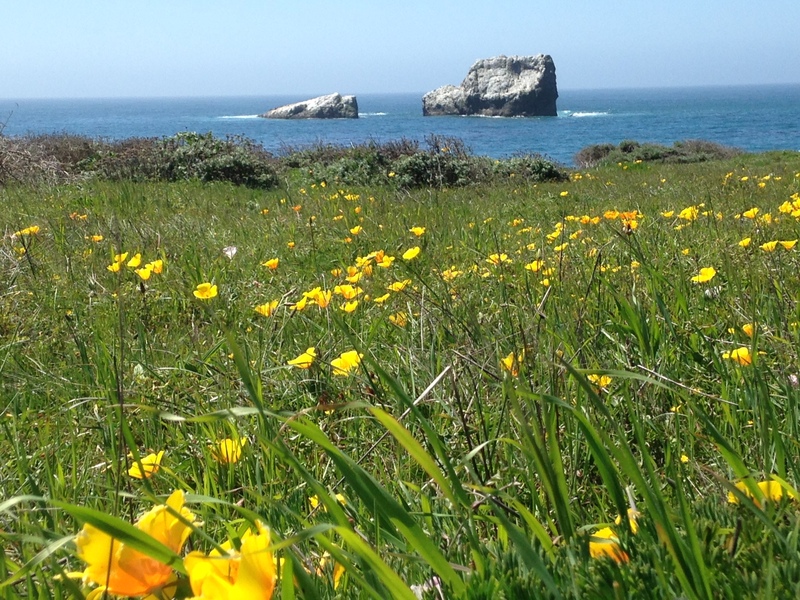 Also, on the drive home, in addition to laughter and good music, we shared a terrific meal in the sun and a carefree hike along the bluffs before San Simeon. 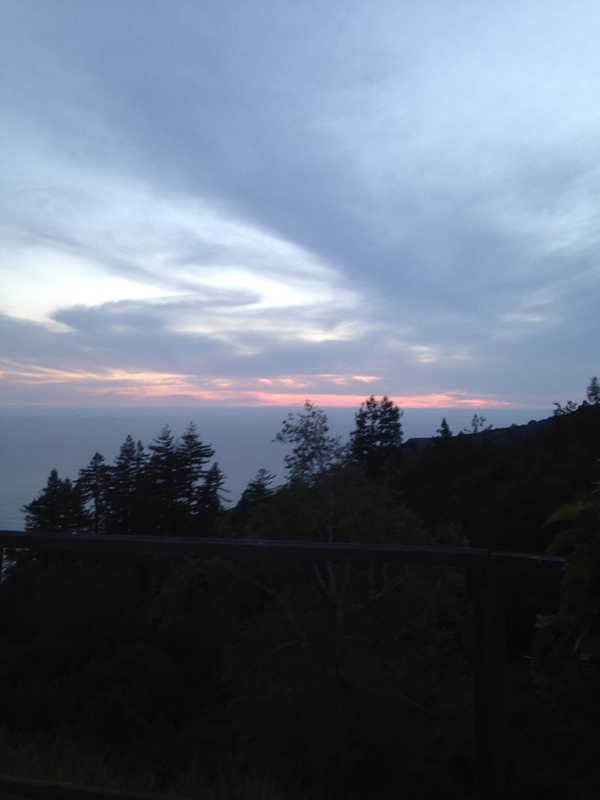 Then home to my sweet husband and a fun evening laughing and sharing the “good vibrations” from Big Sur. More about the rest of the week later. Right now, I’m just basking in joy, gratitude and savoring the sweetness of life. Hope you are too!